Picture this; It’s 3pm. You’ve been busy for hours and your to-do list isn’t getting any shorter. The hands on the clock are ticking a lot faster than usual, and you can think of only one resolution: a junk food sugar hit. 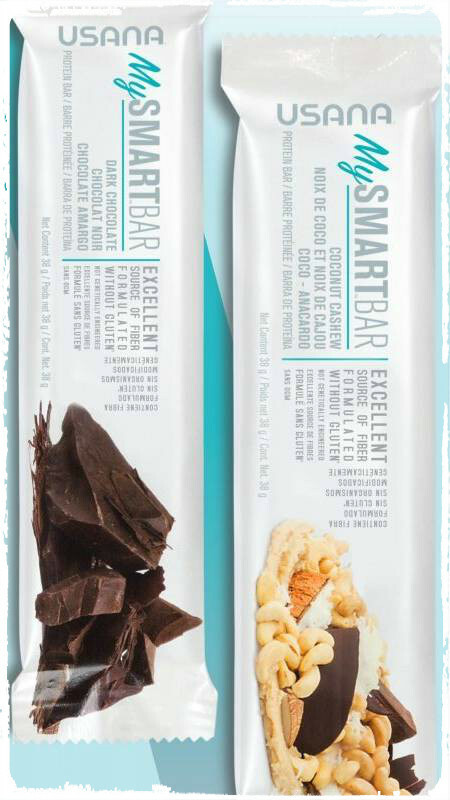 USANA Health Sciences have rushed in to save the day (and expanding waistlines) with the newly launched MySmart Bars. MySmart Bars come in two indulgent and delicious flavours, Coconut Cashew and Dark Chocolate, and with no added sugar they are the perfect solution to satisfying a sweet tooth without any guilt. Not your average snack bar, MySmart Bars are made with high quality and natural ingredients that are sustainably sourced and best of all, are really good for the body. Many of the key ingredients, which include organic coconut oil and roasted nuts, not only provide a high level of protein but are also true wholefoods. Wholefoods (foods that are closest to their natural state) deliver more nutrients to the body than highly refined foods. They are nutrient-rich for the body to digest, which means that after snacking, you will feel satisfied and nourished, as opposed to sluggish, bloated or full. The nutrients found in wholefoods are packed with essential vitamins and minerals, as well as phytonutrients, fibre and essential fatty acids. The benefits of the wholefood ingredients contained in My Smart Bars are endless, and include good nutrition, support for general health, more control over weight maintenance, just to name a few. Great for the time-poor who value a healthy diet, USANA has set out to deliver a quick and simple solution for those searching for wholefoods as part of their daily regime, but still receive the occasional visit from those pesky sugar cravings. My Smart Bars contain 150 calories or less, and are rich in fibre and protein – key to sustaining appetite and energy levels without spiking blood sugar, in turn, controlling healthy weight without depriving the body of the essentials it needs. Finally, a snack that’s a little bit indulgent but free of nasties – and with a few health benefits to boot.